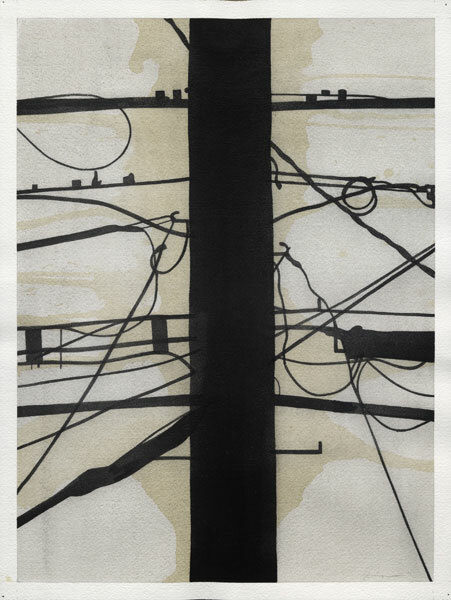 I went with a friend to the opening of the Randy Twaddle show at Moody Gallery, and we were both struck by the silhouette drawings of overhead powerlines. To me, these are very evocative images--they are signifiers of a kind of crummy, low-rent urbanism. Robert Crumb often used them in his comics to indicate "the city"--and particularly the world of the working class. 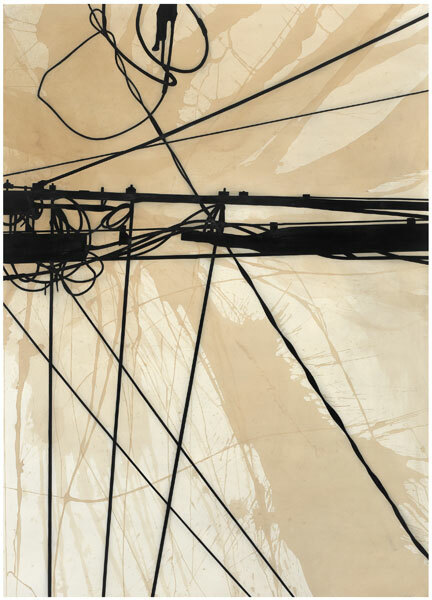 It was a little piece of verisimilitude like this, drawing the overhead powerlines, that grounded even his most extravagant fantasies. Of course, for Houstonians, crappy-looking powerlines cross our fields of vision every time we go outside. They're so ubiquitous that we don't notice them. And when there is more than even a slight breeze in Houston, limbs and trees fall on the powerlines, knocking out power for some unlucky subdivision or two.They are invisible to us until the moment they fail. 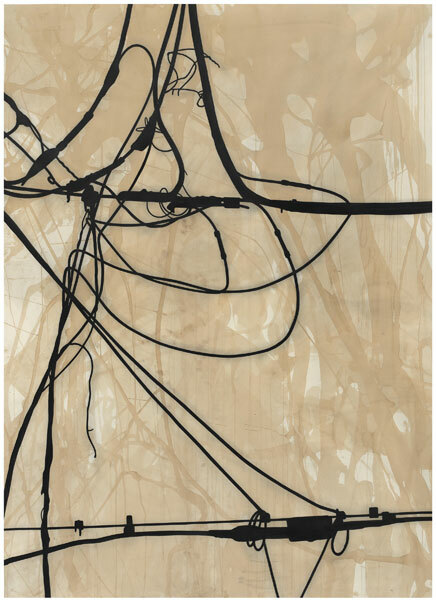 One thing we noticed when looking at Twaddle's power-line drawings were the fuzzy brown splotches that seem to be behind the lines. My friend and I discussed this feature of the drawings. We both noticed that they made the powerline silhouettes pop even more than they would have on plain white paper. They almost give it an effect like a shallowly-focused photo--the powerlines in the foreground are in sharp focus and the landscape behind them is fuzzy. I also noted that the brown blotches looked like drooping Southern vegetation. It made the powerlines seem specific, as if they were located in Houston or New Orleans or some other deep South city. But as we pondered this, I added that the brown blotches also look like coffee stains, so who knows? It was only later that I learned that they were, in fact, coffee stains. It's a weird artistic material, but it really works here. These drawings have a haunted, spare urbanism that I quite like.